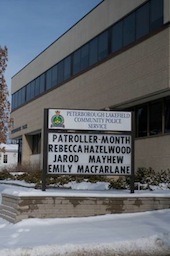 On 04Feb11, officers responded to an Adult Residence for Independent Living in the City of Peterborough. Staff had called after discovering almost 250 pieces of mail in the room of a resident. An investigation was conducted and it was determined that all mail had been stolen from the following list of residences over the period from November, 2010 through this date. the mental capacity to appreciate their actions. Association will meet with the party involved in a diversion capacity. appear to be intact. Many cheques (Christmas Presents) were located.